Use Enbrel strictly as your specialist instructs you. This will make sure you get the full benefit of your treatment. It is equally important that you take all necessary precautions to ensure appropriate use of Enbrel. Your specialist will have reviewed your case already, but please also read the following checklist yourself before you start treatment. If you answer ‘YES’ to any of these questions, tell your doctor before injecting Enbrel. Chicken pox or have been recently exposed to chickenpox. Make sure everyone involved in your health care, any other doctor, dentist or pharmacist, knows that you are on Enbrel. 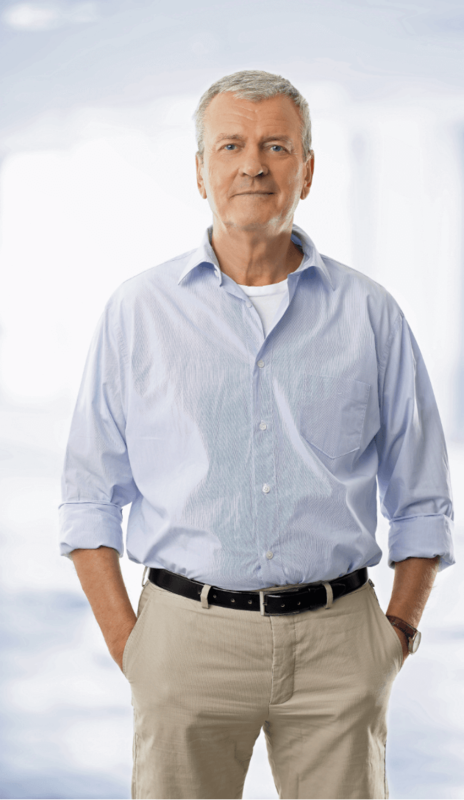 The following section explains how to prepare and administer Enbrel using each of the different methods for injecting yourself. You should continue to inject Enbrel for as long as your doctor recommends. Never inject more than the dose recommended by your doctor. If you feel that the effect of Enbrel is too strong or too weak, talk to your doctor or pharmacist. Enbrel is injected just under the skin in a part of the body that is easy to reach. The best places are the front of your thighs, your abdomen (not too close to the belly button) or outside of your upper arms. You or a caregiver should receive training from your healthcare professional for the first injection of Enbrel. View step-by-step instructions below. 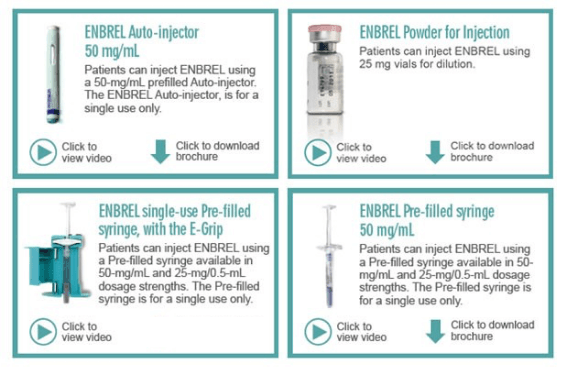 You can also request an informative DVD with step-by-step lessons on how to inject Enbrel in the Enbrel Resources section of the site. The most common side effect is a mild reaction in the area where Enbrel was injected, including: itching, bruising, redness, bleeding, swelling, pain or hardness around the injection site. These reactions generally do not occur as often after the first month of treatment. If you are concerned about injection site reactions, make sure you contact your healthcare professional. Always use the sharps container provided to dispose of used Auto-injectors or Pre-filled syringes. Once the container is full, consult the needle destruction brochure in your patient pack for instruction on responsible needle disposal. Phone 0800 ENBREL (working hours 10am-7pm) for a new sharps container to be sent to your home. Or you can register for Enbrel Resources which offers you helpful tips and information about needle disposal and exchange. You can also order replacement sharps bins and other resources here. Swabs and cotton balls can be placed in the garbage unless otherwise instructed by your doctor, nurse or pharmacist. 2) Select a well-lit, flat, working surface and clean in advance. 4) Take one injection out of the carton and place it on the flat work surface. 5) Return any remaining Enbrel preparations to the refrigerator (between 2° to 8°C). If you have any questions about storage view the storage instructions on this site or contact Pfizer Medical information for further instructions on 0800 675 229. 6) DO NOT shake the Enbrel Auto-injector or vial. If the expiration date has passed, do not use it, and contact your pharmacist for assistance. 8) Wait 15 to 30 minutes to allow the Enbrel injection to reach room temperature. 9) DO NOT remove the needle cover while allowing it to reach room temperature. 10) DO NOT warm Enbrel in any other way (e.g. do not warm it in a microwave or in hot water). 11) Assemble any additional supplies that you may need for your injection. These could include a cotton ball or gauze and a sticking plaster. 12) Wash your hands with soap and warm water. The best places are the front of your thighs, your abdomen (not too close to the belly button) or outside of your upper arms. Pick a different injection site every time – at least 3 cm from an old site. When injecting, remember that you need a firm surface to push against. So if you are using the abdomen, for example, you may need to pinch the skin before injecting. Note: this is particularly important if using the Auto-injector, which has a safety mechanism that requires a small amount of pressure to be applied before injection. Once you have chosen your injection site, wipe the area with an alcohol swab and allow it to dry. DO NOT touch this area again before giving the injection. You are now ready to inject your Enbrel. Do not use the outside of the upper arms for self injection. Only use this Area if you are administering the injection for someone else.